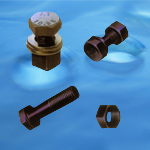 We produce the structural bolts with different size, material and strength grade. Size ranges from M12-M30, material is in 20MnTiB, 15Cr, 40Cr, 30CrMnSi and 15MnVB and the strength grade is classified by 8.8, 10.9 and 12.9. The surface treatment is also available by blue/white zinc, multicolored, the Dacromet treatment and black zinc. Products can be manufactured in compliance with different international standards, such as: GB/T192-2003, Germany DIN ISO68-1:19999, France NF ISO68-1:1999, Japan JIS B 0205-1-2001, Russia GOST9150-2002, America ASTM B 1.13M-2002, British BS ISO68-1:1998 as well as ISO standard. The heavy hex bolt is widely used in railway, bridge, boiler, steel structure, hoisting machine and other large size of steel structure project.